Truth be told, I am a huge classic Hardy fan. You wave a pre-war lead-finished Perfect with a well-loved patina in front of my face, and I’ll start drooling like it was a rack of steaming ribs (and I love ribs). In recent years Hardy has had a bit of a Janus-like personality; on the one hand, they have returned many of their classic models to production, while on the other they have struck out with some truly unusual modernistic designs. Both lines are excellent, but to me the classic reels are truly exceptional. For those who aren’t Hardy aficionados, the appeal here may be non-obvious. Classic Hardys, after all, have classic drags; they also look old-fashioned. The thing is, as anyone who has ever used a Hardy will attest, you really don’t need a cork disc drag to subdue a trout (or even a salmon). Few reels have the sonorous qualities of a vibrating Hardy with line going out; they are tuned like an instrument and truly musical. Hardy’s original lead-based finishes are now (justifiably) banned due to environmental concerns; their new finishes make use of creative anodization and are far more durable than the mid-1970s paint Hardy used once the lead was gone. Better still, the new reels are machined with computers out of bar stock aluminum (instead of being die cast) and have tighter tolerances than ever. 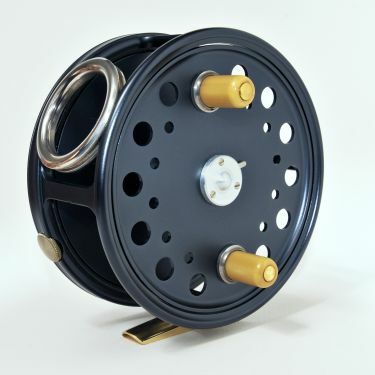 This year Hardy is bringing back four classic reels: the Princess (a four-reel series similar to the Lightweight, in 5-7 weights, from $225-295), the St. George (two highly-desirable reels on the classic market, in 3″ and 2 9/16″, at $795, available in two finishes), the St. George Hotspur (pictured) (a 4 1/4″ salmon behemoth based on the original 1921 model, unusual in having two cranks), and finally the Salmon Perfect (4″ and 4 1/4″ of Spey-rod balancing bliss, and the series that wrote Hardy its original meal ticket). Both the Salmon Perfect and the St. George Hotspur are available now, while the St. George and Princess series will be released in November 2009 and January 2010, respectively.